Lewis Cook celebrates his first goal for Leeds United at Doncaster before getting sent-off. Leeds United became the ninth Championship side to go out of the Capital One Cup at the first round stage as they lost on penalties at Doncaster Rovers. On a ground where they had never lost the evening started well for Uwe Rosler’s men when Lewis Cook shot them into a 15th minute lead with his first-ever goal. But it went wrong after Scott Wootton’s clumsy challenge gave Rovers a penalty equaliser and Cook came up with another first when sent-off for a two-footed challenge. Although United defended well and put in a big shift in a rearguard action they were unable to score again and after an extra half-hour they went into a penalty shoot-out. Bad spot-kick misses by Sam Byram and new multi-million pound striker Chris Wood then saw them lose 4-2 and they are out of this competition for the first time at the first round stage. 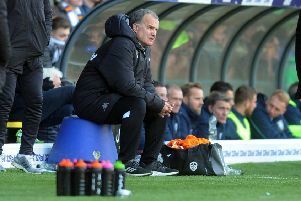 Mindful of having two league games in the next week, Rosler left out five of the players who started against Burnley last Saturday with Ross Turnbull making his debut in goal, Liam Cooper restored to the back four, Wootton surprisingly chosen in midfield and Souleymane Doukara and Mirco Antenucci selected up front. The head coach got the start he wanted as Leeds started brightly and went ahead when Mirco Antenucci’s cross-shot was palmed away by home keeper Thorsten Stuckmann straight to Cook who calmly stroked the ball into the net for his first goal in senior football. Doncaster looked to hit back as James Coppinger lifted a lob over Turnbull, but Giuseppe Bellusci hooked the ball off the line at full stretch. Leeds still looked the better side at this stage, however, as Doukara went on a good run and saw his dangerous cross just evade Alex Mowatt and Stuart Dallas’s effort was denied by Andy Butler’s sliding tackle. But the game changed when Wootton brought down Cedric Evina and Andy Williams tucked the resulting penalty under the body of Turnbull to make it 1-1. It went from bad to worse in the 37th minute when Cook was shown a straight red card for a two-footed tackle on Doncaster left-back Aaron Taylor-Sinclair and they were forced to play the remainder of the tie with 10 men. Surprisingly Rosler did not make any changes until midway through the second half and Leeds slowly found themselves penned back. Rovers only had one real chance up to that point with Turnbull saving Williams’ well struck effort. Rosler tried to win it by putting on Wood and fit again Luke Murphy initially before turning to Byram, but it was the hosts who came closest to score again in the remainder of normal time. Coppinger sent several shots wide, Rob Jones saw a header comfortably saved by Turnbull while Williams was just wide with a header. Leeds had a big shout for a penalty when Wood tussled with Luke McCullough, who had a hold of the striker’s shirt, but the referee was having none of it. In extra-time it was 10-man United who came closest to breaking through when Antenucci’s shot took a deflection and was then pushed onto the post by keeper Stuckmann. But neither side could win it in a dull extra half-hour that they could have done without and it was all down to penalties. Antenucci and Murphy confidently put away the first Leeds penalties with Nathan Tyson and Williams replying for Rovers before Byram sent his spot-kick high over the bar. Harry Forrester was successful with his penalty, but Wood blasted his effort horribly over and Richie Wellens duly scored next to complete a disappointing night for Leeds, who must now pick themselves up for away league games at Reading and Bristol City, when they will be without all-action midfielder Cook. Doncaster: Stuckmann, McCullough, Butler, Jones, Taylor-Sinclair, Evina (Tyson 73), Wellens, Middleton (Main 101), Forrester, Coppinger, Williams. Leeds: Turnbull, Berardi, Bellusci, Cooper, Taylor, Wootton, Cook, Mowatt (Byram 74), Doukara (Murphy 67), Dallas (Wood 67), Antenucci.